Easter is less than 2 weeks away which means all the Easter craft fun begins! This year is my first year as a school mum so with that comes a few exciting extras too, including our first Easter bonnet parade on the last day of term next week. While some of my mum friends are cringing at the thought, I can’t wait! And it only took me 15 minutes to get organised! 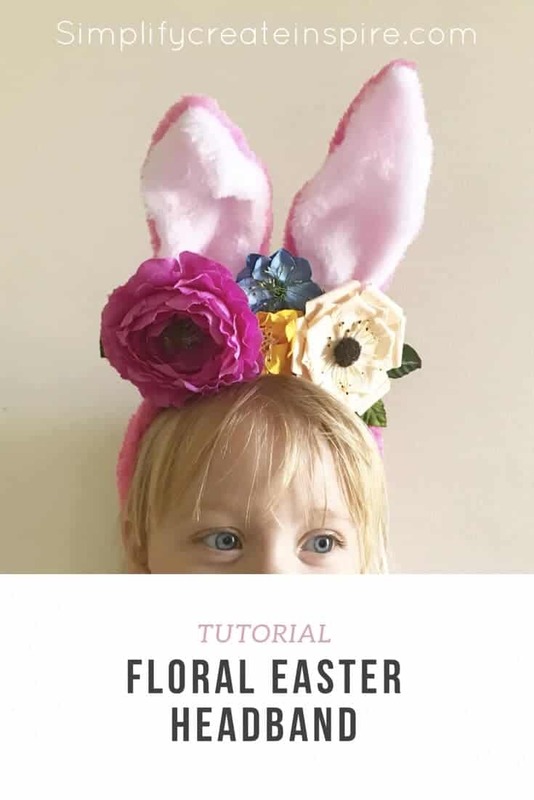 A friend of mine gave me the idea of bunny ear headbands as an Easter bonnet alternative and with a total girly girl like my little prep kid, a flower loaded headband is exactly what will make her happy! So it’s a win win for both of us really! And you can do the same! I had all these flowers in my drawers already from my scrapbooking days, which is something I don’t often do these days. The headband cost me $2 from The Reject Shop here in Australia. Nothing fancy. Spend some time working out how you want your flowers and leaves to be displayed on the headband. I played around with a few different styles before I finally decided on the look I wanted. Once you know the position you want them all in, glue each item one by one onto a semi circle scrap of felt. Alternatively you could use fabric or you could glue your flowers directly onto the headband. I wanted to make sure they held well, which is why I used the felt backing. Glue your felt onto your headband, making sure it isn’t sitting too low. This may impact how the headband sits on your child’s head so making sure it will sit firming once glued. And once your flowers are in place, you are ready to roll! My school kid was at school during our mini Easter craft session so I had to get her little sister to model for me! Now she wants her own so it looks like I’m headed back to the shop this week to get another headband. Silly me… of course they both want one! So there you have it… the quickest Easter bonnet parade alternative – the Floral Easter Headband! And super pretty too! You could use different types of decorations to suit little boys, like easter eggs or chickens to create an Easter scene instead. Pretty much it’s all up to your imagination! Do you love or loathe Easter bonnet parade time? These are so pretty. My kids are a little older but we always made easter bonnets for them. We have a school Easter hat parade too coming up. I grabbed some bits from Aldi for it but you have reminded me to get organised and find that glue gun! How gorgeous! I want to make one for myself! Wow, How cute it is? How can you do it? I am amazed to see this. I am too excited to make it for my little girl. Hope so she also likes it. Thanks for the sharing this.